Through an innovative and intensive mentoring program called Springboard 2.0, SD Sport Innovators have been successfully assisting local emerging sport & active lifestyle companies in Southern California since Springboard became a standalone program in 2011. SDSI's Springboard 2.0 was adapted from the original Springboard program started by SDSI's parent company CONNECT over 20 years ago, which focused on the technology industries, and the organization has successfully graduated 16 companies through Springboard and there are currently four companies participating in the new and improved Springboard 2.0. Now, SDSI is currently accepting applications for this completely free business mentoring program and is looking for a wide range of sports start-ups to work with later this year. 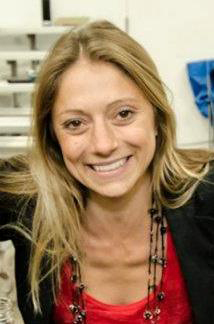 “One of the most important things that I’d like to see is to incorporate a more diverse portfolio of participating sports companies in the Springboard program,” explained SDSI Program Director Renne Catalano in a phone interview from earlier this week. The amazing team at SDSI; from l-r: Executive Director Lisa Freedman, Program Manager Garrett Hall and Program Manager Renne Catalano on the right. SDSI is currently working with four companies set to graduate from the Springboard 2.0 program in less than a month, can you go into detail on the companies participating in the program? Sure, well we actually have three companies set to graduate this month and one company will continue with mentoring. Arcade Belts designs, manufactures and sells belts targeting the action sports market that are more flexible more durable and more comfortable for the athletes using them than current belts on the market. Another is Dual Snowboards who offer a completely new product to the snow market with Dual’s, which are essentially two mini snowboards, one for each foot. This separates your feet so you’re not connected to one board you can actually walk or run while still strapped in, meaning you do not have to take off your bindings to get on lifts or across flat surfaces. Their goal is to create a new sport in the industry as Dual Snowboarding. Next we have StrongVolt Solar, they sell portable solar panels and battery packs so you can charge all your electronics devices while you’re out in the wilderness. Their solar panels are 20% cheaper and charge you phones 20% faster than the competition. Modular Design Theory, MDT, which just launched at AGENDA in January, makes bags for the action sports industry with solar panel accessories. They also sell portable battery chargers for your cell phone; they have a partnership with Steve Berra which is very influential in the skate industry. That certainly spans a wide range of interests targeting a wide range of consumers – what is the selection process like for the companies that eventually participate in the Springboard program? 1. Coachability – if an entrepreneur is not coachable and is not open to feedback and change than the program will not be a positive experience for the mentor or the entrepreneur. 2. Market Opportunity - there needs to be a large market that will pay money for what the company is selling. It may seem intuitive but it is not always the case. What was the initial inspiration for the program? Our mission is to inspire sports innovation and to help accelerate the sports economy here in Southern California and that starts with taking ideas and dreams and helping them grow into sustainable businesses. CONNECT, our parent organization, created Springboard 20 years ago to help bring technology innovation out of the research institutions into the business world. We started the sports arm of springboard so that we could most effectively help the sports companies. We also try to help companies fail fast too. Meaning if someone comes to us with something that’s not a viable business opportunity, we’ll try to make recommendations before they invest too much time and money into something that may not have a realistic growth opportunity. 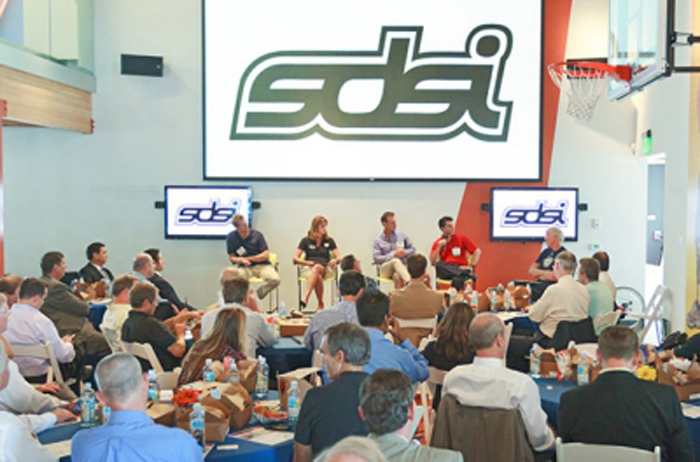 A look at the panel from an SDSI event's CEO Dream Team Luncheon. How often do you find yourself in that position, of having to be the bearer of bad news, in a sense? Well, you never want to destroy anyone’s hopes or dreams but we’re there to give our recommendation. Everyone that comes to us, even if it’s not a fit for our program, we provide follow up to help the entrepreneur digest the feedback they received and tell them where we see room for improvement. If someone has approached us and they are applying to Springboard, we always provide them with some sort of feedback and a follow up. The Springboard Program was recently revamped – can you speak on the changes made to the program? Sure, we revamped things last September, to make it a more efficient and effective program for all involved. The program is really based on our volunteers - the mentors and experts who donate their time - and entrepreneurs who are really busy trying to run their businesses at the same time they are trying to focus on Springboard. And Springboard is a very intensive program that requires commitment and dedication so it is important that the program be as streamlined as possible. 1. We used to have an open application process where people could apply at any given time. But, now we have companies apply in a batch, so we can better assess the quality of the companies and best match them with the mentors that we have. 2. This also creates a more collaborative environment so accepted companies can work together as a class opposed to working solo through the program. They can view each other’s presentations at each milestone and learn from the feedback they hear for each company. 3. We have helped to establish accountability and a sense of a schedule by putting dates in place for each millstone. This helps the entrepreneurs and their mentoring team to have something to works towards. What is the setting and environment for the mentoring sessions once companies are selected and the program has gotten underway? The first portion of the program is focused on refunding the business model and creating the 15 investor presentation. We provide each accepted company with a SDSI Investor Presentation Template that they work on with their mentoring team and present at each milestone. Next the focus is on refining the 15 minute presentation into an effective 5 minute “Quick Pitch”. If you can’t sell your business in 5 minutes you will never get a follow up meeting to present your full business opportunity. We’ve created a class atmosphere so that the companies convene every six weeks at a milestone and it’s a really good learning opportunity. Each company presents to a room of mentors. There is then time for Q&A. This portion is really important to help the entrepreneurs anticipate the type of questions investor will ask. It also gives them the opportunity to work on answering questions confidently and without getting defensive. Next there is then an opportunity for the mentors to provide feedback which will then be incorporate in the entrepreneurs presentation. Each company is encouraged to watch all the presentation and it is a great learning opportunity. Between each milestone the entrepreneurs are working with their mentoring team to incorporate feedback from the panel into their presentation. Are you aware of any similar programs either locally or nationally that offer the same service, or did you model Springboard after another program? I’m not aware of any similar programs specifically in the sports industry, no. There’s nothing out there like us. CONNECT has done a really great job with Springboard helping the technology sectors, and being our parent organization, we’ve tweaked and tailored what they have been doing successfully for 20 years to make it work for the sports industry. A look at an SDSI Chalk Talk event, this particularly one was on Doing Business Internationally. How have you grown the program since becoming a standalone in 2011? We have worked really hard to grow our mentor pool of sports specific CEOs. There are challenges unique to the sports industry – which includes a lot of consumer product companies. Having mentors who have experienced those same challenges and have connections within the sports industry is very crucial for our Springboard companies. We have an advisory board that we’ve grown from four to twenty-six over the last three years and they’ve all been great advocates for Springboard. Many of the advisory board members are also mentors in the Springboard program. How have you managed to gather so much support from volunteering mentors to the industry-leading advisory board? We basically started with a core group on sports oriented individuals who were involved from the Connect Springboard program and we grew from there. From there it’s really been word of mouth. Mentors refer others and our Advisory Board also refer people to the program. Giving back can be contagious. Can you detail any Springboard participants that have gone on to realize their dreams? Well, I hate to just pick one – we’ve had so many great successes – but one that stands out is a company FanxFan which graduated last year. They just relaunched the company as Soccerly.com in January and we recently did a case study on them, which is on our website. Karlo the founder of FanxFan met one of his advisors – Miguel Romeriez a co-founder of Medio Tiempo, the number one sports website in Mexico which sold to Time Warner in 2010. Miguel soon became a partner in FanXFan and together they have taken the business to a whole new level of capabilities. Soccerly.com now aims to become the #1 soccer new website in the US. We also had six companies present at a capital event at Bill Walton’s house last November every company was approached for follow up meetings and one company Bon Hiver is working on a term sheet. And looking forward to the rest of the year, obviously you have one Springboard class set to graduate soon and are in the works for another program to get started in the next few months – what are the plans for continuing the program in 2013 and beyond? The goal is to open applications once a quarter once we have enough mentors to support that frequency. We received 14 applications for the first class of Springboard 2.0. As people become more aware of Springboard we hope to increase the number of applications we receive from companies with great market opportunities or new innovative and game changing technologies across all categories of sports. We are currently accepting applications for the upcoming class, and we’ll close that on March 3rd then have the official intake panel around the first week of April and from there they’ll have four months to work through the program. Can you speak on any challenges you’ve come across in developing the Springboard program to be where you are today? Can you speak on the other services that SDSI currently offers? Our cornerstones initiatives are elite-level networking, business education, business mentoring and capital funding opportunities. We get really great feedback from the quality of the networking we facilitate within the community we have created for the sports businesses here in SoCal. Our network is comprised of business leaders of fundamental service providers, to industry CEOs and veterans, to serial entrepreneurs and first time entrepreneurs. We’re able to create a platform that facilitates collaboration and introductions between our members who may not have necessarily had a reason to otherwise meet. Every day Lisa Garrett and I receive calls from our members telling us about a new business partnership that emerged from an introduction we have made for them. We are very proud of that. What has been the biggest reward for you working with SDSI? Well, entrepreneurship is a really contagious spirit and really entrepreneurs’ brains, in my opinion, are wired differently – in the best way, of course. Everyone we work with has a lot of foresight, and is very driven, and dedicated to getting their dreams off the ground. Working so closely with that type of enthusiasm and work ethic is very inspiring. These entrepreneurs are also very appreciative of any support, feedback and assistance. And they are all really grateful for the FREE services Springboard provides. It’s really a cool thing to be around people who appreciate and see the value of what you’re providing. I wanted to stress how grateful we are for our mentors. We are able to offer this free program based on the dedication of the volunteers, who put in a lot of time and more than that they are genuinely invested in these companies. More often than not the participating companies will maintain a relationship with their mentors after they graduate the program and the mentors really love their involvement. They want these companies to be successful beyond completing our program.